SAN FRANCISCO (KGO) -- The NFL season gets underway this week and San Francisco is taking center stage. The host committee of Super Bowl 50 at Levi's Stadium is getting things started with a two day event called the "Kickoff to 50 Celebration" at Pier 35. Among those on hand were Super Bowl MVP's Jim Plunkett of the Raiders and Steve Young of the 49ers. "I'm here today to look forward to the next 150 days culminated by the big game, but more importantly, how people see us from around the world, us in the Bay Area, in a great light," Young said. Fans attending the event are encouraged to dress up like a Raider or a 49er. 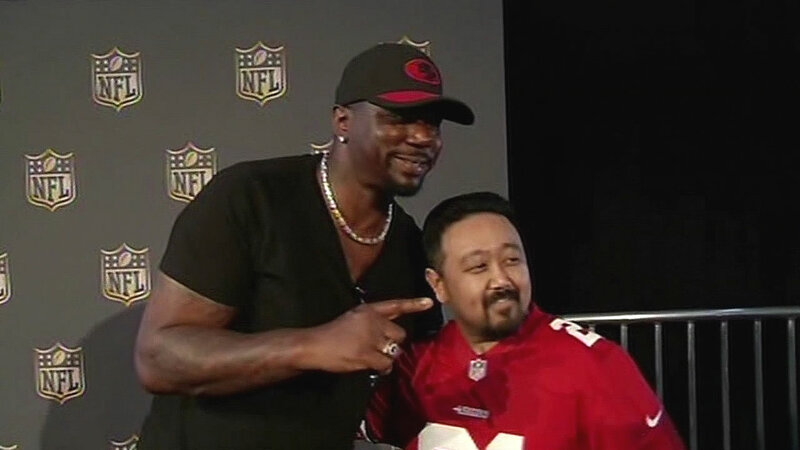 You can have your pictures taken with a Super Bowl legend like Raiders Hall of Famer Willie Brown, or 49er standout Rickey Waters. Here a fan poses between the busts of Oakland Raiders and San Francisco 49ers Hall of Fame players are on display at Pier 35 in San Francisco, Calif. The busts of Raiders' and 49ers' Hall of Fame players are on display. The event wraps up with a free concert featuring the band Train Thursday afternoon at Justin Herman Plaza.